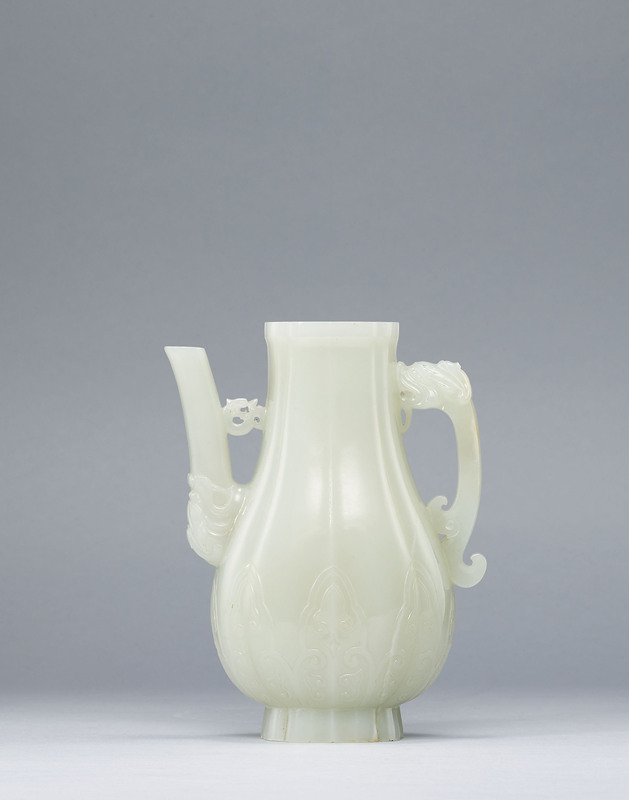 The well carved flattened pear-shaped ewer is supported on a lobed spreading foot, with the sides of the body of conforming shape and decorated with stylised ruyi. One narrow side is carved with a dragon-head handle and the other with a spout emerging from a monster mask. The stone is of an even white tone. Acquired by the father of the present owner in Saint-Petersburg circa 1960, thence by descent. The present Lot and Lot 251 come from a European private collection of Asian and European Art. A part of this collection of has been donated to the Hermitage Museum in Saint-Petersburg, Russia. has been donated to the Hermitage Museum in Saint-Petersburg, Russia.